Video clip synopsis – The original handwritten score for Waltzing Matilda holds the story of a musical collaboration that created Australia’s national song. Broadband MP4 waltzing_bb.mp4 (17.4MB), suitable for iPods and computer downloads. Waltzing Matilda is an episode of the series National Treasures produced in 2004. Most Australians know that Banjo Paterson wrote the lyrics to Waltzing Matilda but who wrote the music? And what does it have to do with a rather oddly titled song called Go to the Devil and Shake Yourself? 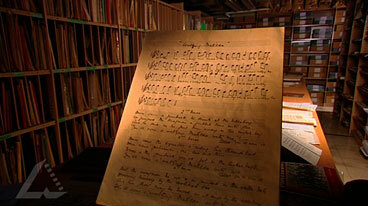 Warren Brown tracks down the original handwritten score at the National Library of Australia, where curator Robyn Holmes reveals the story behind the chance collaboration that created our national song. texts in books, films, and on television programs, CD-ROMs and websites. readers’ and viewers’ interpretations of texts are influenced by the knowledge and values of the groups to which they belong, and by their own experiences. aspects of subject matter are selected to appeal to, and to influence, different groups of readers and viewers. Students write texts to entertain, inform and persuade in print and electronic mediums for unknown or specified audiences. can draw on the subject matter and forms of texts they have heard, read and viewed. Students speak and listen through discussions, conversations and oral presentations including prepared and spontaneous discussions, meetings, debates and group discussions. Students examine ideas and information and present arguments that are drawn from topics of interest to them and that may need to be researched. This resource is also relevant to Media Studies: Audiences, the Documentary genre, Media in society, Representation and Media production. Teachers and students should also consult their state’s curriculum and learning programs. Waltzing Matilda is Australia’s most widely known traditional song. Banjo Paterson wrote the words during a visit to a Queensland property, Dagworth, in 1895. The words may refer to an incident the previous year, when striking shearers burned down the Dagworth shearing shed. The owner of Dagworth station and three police chased a man named Samuel Hoffmeister, who shot and killed himself at the Combo waterhole rather than be captured. The origin of the music is less certain. Christina Macpherson first played it on the piano at Dagworth. She later claimed to have remembered hearing a song Thou Bonnie Wood of Craiglea a few months earlier at a race meeting. However, there is little actual similarity between the music on the score that she produced and ‘Craiglea’. That tune was itself possibly based on a tune called Go to the Devil and Shake Yourself, and also sometimes called The Penniless Traveller or When Sick is it Tea You Want?. The first published version of the music, produced in 1903, used a different tune — the one we identify with the song today. This is the Marie Cowan version. This version is, however, similar to a much older song called The Gay Fusilier, which Paterson may have heard during his time in South Africa, and brought back. Another version dates from 1907, in Cloncurry. The words are more certain, but also exist in several versions. We have Paterson’s original words, but in 1903 Marie Cowan changed the words slightly to identify the song with a commercial brand of tea, ‘Billy Tea’. During the 1970s there was a popular vote to decide what would be Australia’s national anthem to replace God Save The Queen. Advance Australia Fair won. For a short while Waltzing Matilda was Australia’s national song, usually associated with sporting events, but now has no official status. Write a brief summary of the history of Waltzing Matilda as presented in the documentary and present a review of the documentary, orally or in writing. Describe its impact on you as entertainment and information. What other content could have been included to improve the documentary, if any? What is the political meaning behind the lyrics? What other songs do you know of that express a political view? How is the song sheet presented in the documentary? Discuss the narrator’s style, the production style and interview. Look at the two versions of the words. You will find these in the link in the Further Resources section below. Compare the two versions. Identify the words that have been changed. What is the effect or impact of these changes? What is the message or meaning of Waltzing Matilda? Many people have suggested that Waltzing Matilda should be Australia’s national anthem. Do you think these words are suitable for an anthem? Explain your reasons. Look at Australia’s anthem, Advance Australia Fair. What is the message or meaning of those words. Do you think they are appropriate for an anthem? Explain your views. What would you choose as Australia’s national anthem? Look at words of other popular anthems, particularly those of USA, Britain and France. What are the messages or meanings of those words. Do you think they are appropriate for anthems? Explain your views. Look at the anthems of South Africa and East Timor. What are these words trying to achieve? Go to Music Australia for versions of Advance Australia Fair and Waltzing Matilda. Go to Screen Education for excellent articles and study guides focusing on all aspects of Australian documentary form and for detailed instructions for producing media texts. Go to The Australian Children’s Television Foundation Education Catalogue to order a film version of Waltzing Matilda from the Kaboodle Television series. This version is a claymation that presents an amusing reinterpretation of the song.